A Description of 20th Century Fox's Upcoming Trailer for Ridley Scott's 'PROMETHEUS'! 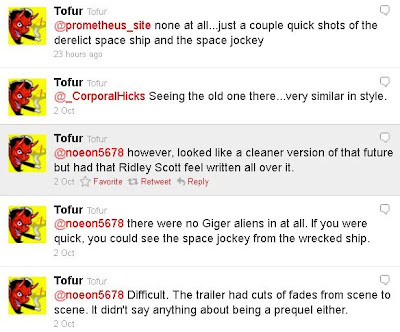 Movie theater operator Christopher Duvall has ran theaters since 1986 & according to his tweets the man claims to have seen an advanced copy of Ridley Scott's Prometheus trailer. Writing to prometheus-movie.com in response to the many questions he received on twitter Mr Duvall gave a very detailed description of the upcoming trailer which you can check out after the jump. Prometheus stars Noomi Rapace, Charlize Theron, Idris Elba, Logan Marshall-Green, Ben Foster, Michael Fassbender & hits theaters on June 8th, 2012. Update: Fox state [via /Film] that not trailer has been yet cut. I presume they are disregarding the Comic-con Sizzle reel. Synopsis: Ridley Scott, director of Alien and 'Blade Runner,' returns to the genre he helped define. With 'Prometheus', he creates a groundbreaking mythology, in which a team of explorers discover a clue to the origins of mankind on Earth, leading them on a thrilling journey to the darkest corners of the universe. There, they must fight a terrifying battle to save the future of the human race. Description: "Had to join to to comment on this. I am the Chris that saw the trailer. I run a theatre in the Denver area and my theatre has Nielson kiosks in the lobby for surveys of upcoming titles. They told me that they had few different trailer for various movies, but when they said PROMETHEUS, I said I must see the trailer. It was nearly 2 minutes long and looked fairly polished and complete. 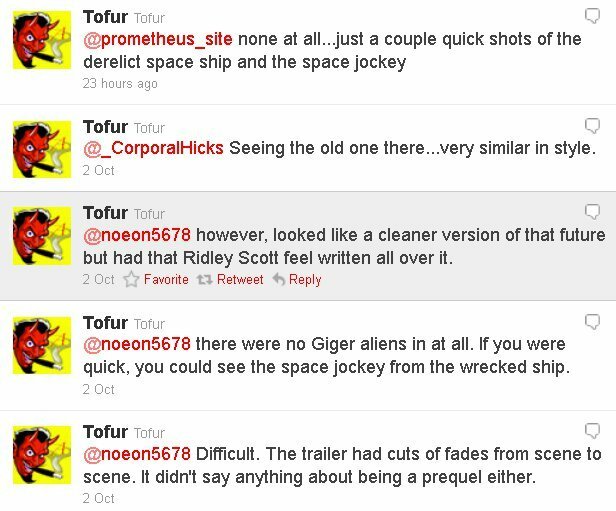 It was using a temp track for music and the trailer was VERY similar to the original teaser for ALIEN the way is was cut together. Quick shot after another. Had a couple a lines of dialog I think but is was hard to hear since my lobby was a bit noisy. The planet they showed in the trailer looked nothing like original one where the derelict was crashed. It was sunny and desert like in appearance. The space suits the characters were wearing were VERY similar to the original suits worn by the crew of the Nostromo. The interior shots of their ship looked clean and not used like the the NOSTROMO did. It was all new and shiny looking. I did not see an exterior shot of the derelict ship but there were some really quick shots of the inside like the jockey, another room that looked like were the jockey was but without it, the room with the eggs but there were no eggs in it. There were some quick shots of the crew walking in the same "halls" that Kane and Dallas walked in as well in the derelict ship. But these things were hitting the screen so fast, it was hard to process all the information. Some of the crew look were in medical/cryo-tubes with something moving in their abdomens not their chests. Their eyes also appeared to be completely black and the faces altered I think. The end of the trailer ended with the title forming much like the ALIEN title did in the original movie at the top of the screen. However, there were no mentions of the original movie at all. No Giger aliens, no eggs, nothing at all to pin this being a prequel. It just "looks" like it was from that universe." I'm reading: A Description of 20th Century Fox's Upcoming Trailer for Ridley Scott's 'PROMETHEUS'!Tweet this!